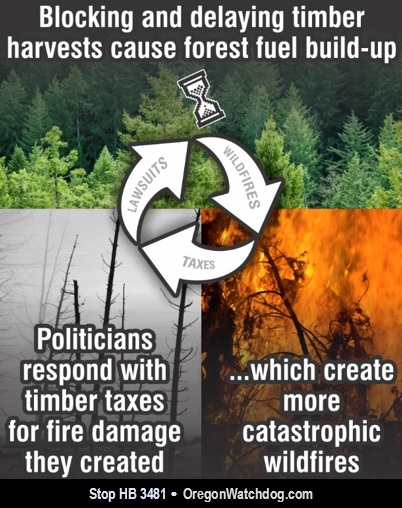 Oregon Legislature floats HB 3481 which taxes timber to pay for wildfires. The 2015 Legislature has been having hearings on Timber Tax bills including HB 3481. The idea behind HB 3481 is to tax timber to help pay for wildfires. It is almost like taxing concrete to pay for earthquake damage. It is even more unbalanced when it is considered that harvesting timber helps to reduce forest fires by removing forest fuel and aging timber more at risk for catastrophic wildfires. This insanity can be shown in the nearby infographic where Oregon suffers from a recycle of death of lawsuits, wildfires and taxes. The Legislature is looking for $30 million, and cannot seem to find it within their near $60 billion budget or their billion dollar increase in new revenue. During testimony it appeared that the timber tax supporters had changing targets and reasons behind the tax. 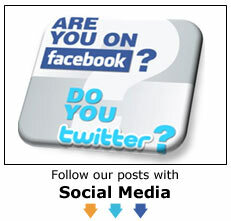 This makes the tax seem uneccessary and capricous which are the hallmarks of bad legislation. Bill watchers say that this bill may even be illegal on how it plans to be implemented. The Bureau of Land Management (BLM) released draft Resource Management Plans for six districts in Western Oregon encompassing over 2.5 million acres of BLM-managed forestland, including the Oregon & California (O&C) Grant Lands, for public review and comment. Once finalized, these plans will replace Northwest Forest Plan-era plans and guide the future management of these lands, including outlining sustained-yield timber harvest levels as required by federal law. The American Farm Bureau Federation today applauded the Senate Committee on Finance for its approval of the Bipartisan Congressional Trade Priorities and Accountability Act of 2015. As Executive Director of the Oregon Cattlemen’s Association, I, Jerome Rosa, ask you to please vote no on HB 2012. Oregon’s minimum wage is currently at $9.25 per hour and as such, is the second highest minimum wage in America. Increasing minimum wage with a goal of $15 per hour will devastate Oregon’s economy and discourage job growth. 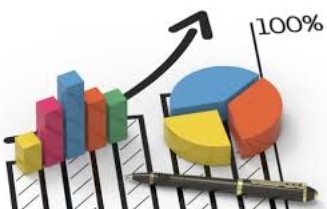 Small businesses will be forced to go through additional rounds of layoffs due to their inability to sustain their current amount of employees at the proposed increase. Larger businesses may be able to keep their staff, but will likely be forced to reduce an array of benefits which will ultimately hurt Oregon families. The U.S. Fish & Wildlife Service (USFWS) recently announced it will consider changing the status of the Northern Spotted Owl (NSO) from “threatened” to “endangered” as owl populations continue to decline. The species’ listing in 1990 led to a 90-percent decline in federal timber harvests and restrictions on other forest management activities. 24 million acres of federal land in the Pacific Northwest have largely been set aside for the owl, including 12 million acres of forestland identified as critical habitat. Unfortunately the USFWS’ approach has failed to address the real threats to the species while devastating the socioeconomic health of many rural communities. Any serious effort to recover NSO populations should address the real threats to the species: stand-replacement fire and the barred owl. Claims that a lack of habitat is harming the NSO lack any basis in fact. This backgrounder discusses USFWS’ inadequate efforts to address the species’ most aggressive predator. The barred owl was first detected within the range of the northern spotted owl (NSO) in the 1970’s. Researchers started to become concerned about the impacts the barred owl would have on the NSO in the 1980’s. In 1989, the USFWS acknowledged that the expansion of the barred owl population was of “considerable concern.” The NSO was listed as threatened in 1990. Since then, there has been a steady decline in the NSO population with a concurrent steady increase in the barred owl population. Since 1992, researchers estimate that the NSO as a whole is declining at an annual rate of 2.9 percent and in the areas most heavily impacted by the barred owl at an annual rate of 5.9 percent. 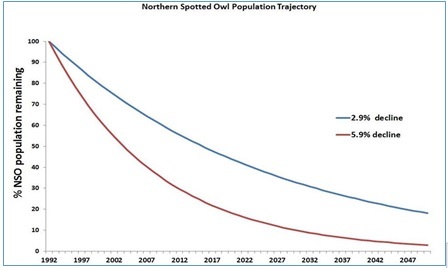 By 2004, the preponderance of evidence lead a team conducting a 5‐year status review to conclude “that the barred owl is a significantly greater threat to the spotted owl than originally estimated at the time of listing.” By this time, the overall NSO population had declined by 30 percent from its 1992 level. In 2008, the USFWS released the NSO Recovery Plan that identified competition from barred owls as a main threat to the spotted owl. Roughly a third of recovery actions address the barred owl threat, including consideration of measures relating to a barred owl removal experiment. In the four years it took to prepare the recovery plan, another 8 percent of the NSO population was lost. In February 2009, a Barred Owl Stakeholders Group was formed as part of the scoping process for the barred owl removal experiment. In December 2009 a formal scoping notice was issued. The final Environmental Impact Statement and Record of Decision for this experiment was signed September 2013. By this time another 9 percent of the NSO population was lost, bringing the NSO population down to 54 percent of its 1992 level. The purpose of the Barred Owl Removal Experiment (BORE) is to gather information on the effectiveness, feasibility and cost of removing barred owls to aid in the conservation of the NSO. (Research on private lands in California and research in Canada had already shown that the NSO population and reproductive success increased as barred owls were removed.) The BORE calls for barred owl removal within four study areas distributed in Washington, Oregon and California, but thus far limited removals have only taken place on tribal lands in California. The USFWS cites a lack of funding as the reason for the slow start but the agency has never requested appropriations from Congress to fund the effort. It is no surprise that there is no firm schedule for conducting this experiment only that “(R)emoval activities will end when data are sufficient to meet the purpose and need.” A maximum duration of 10 years of barred owl removal was stated for the BORE. 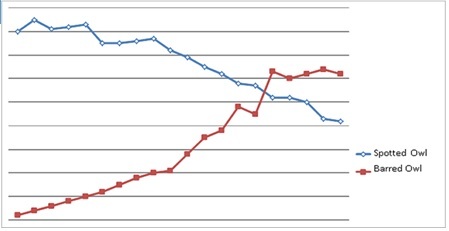 At the end of this 10 years, another 13 percent of the NSO population will be lost. After the BORE is completed (sometime after 2022), if they find that removing barred owls leads to an increase in NSO’s (which is likely), the USFWS would then embark on a lengthy regulatory and legal process in the hopes of removing enough barred owls to make a significant impact on the NSO population. This could take yet another 10 years, at which time the NSO population will only be at about 30 percent of its 1992 level and likely extirpated from major portions of its range. In the meantime, the USFWS has focused on increased restrictions on habitat, claiming that since the NSO population is declining so rapidly “habitat is more important than ever.” The fallacy of this concept is that there are already countless acres of suitable NSO habitat that is devoid of any NSO’s because of the presence of barred owls. Any new habitat that is created or set aside will be occupied by barred owls and therefore of no use to the NSO. This fixation on “protecting” habitat has actually stymied much needed fuels reduction and restoration work needed on our federal lands to reduce fuel loads and the risk of stand-replacing catastrophic wildfire, leading to the loss of spotted owls and habitat. In the ten years since the barred owl was recognized as a significant threat to the NSO, little has actually been done by the USFWS to address this threat. The USFWS has access to a large body of research that NSO populations can be recovered through active forest management and an aggressive effort to eradicate barred owls. Yet the agency appears perfectly content to continually impose new forest management restrictions that will have no impact on stopping the decline of the NSO population and only serve to show they are doing something. This fixation on habitat protection in lieu of addressing the barred owl threat may even result in the loss of habitat to wildfires. It’s time for Congress to pass meaningful reforms to restore active management to federal forest lands, to restore forest heath, improve rural economies and protect wildlife species. The American Forest Resource Council represents manufacturers and companies in the forest products industry. The House voted 240 to 179 today for full repeal of the death tax, a tax that is threatening the livelihoods of farmers and ranchers across the country. National Cattlemen’s Beef Association President Philip Ellis said H.R 1105 Death Tax Repeal Act of 2015 is commonsense legislation necessary for rural America. In addition to hearings on bills addressing forestry issues and antibiotic use in food animals, Farm Bureau testified on several land use bills. On Tuesday, the House Committee on Rural Communities, Land Use, and Water heard HB 3367, which requires a conditional land use approval for bike paths located within lands zoned for EFU. This bill arises from an uncertainty around the current status of bike paths in farm use zones, which has resulted in some counties failing to apply the conditional land use process to bike path construction through farmland. Farm Bureau supports this bill and believes it would give farmers a greater voice in these projects. Thank you to Tina Galloway and Stan Snyder for testifying in support of their community! America has rewritten the rules of the global energy economy, thanks in large part to the tremendous surge in production of shale oil and natural gas. And now there is a growing body of evidence that exporting our natural abundance of energy resources will provide even greater benefits in job creation, economic growth and long-term energy security. To make this happen, we first need to get Washington lawmakers to ease outdated trade restrictions and regulatory delays for oil and liquefied natural gas (LNG) exports. That’s good for Oregon with its export oriented economy and ever closer ties to burgeoning Asia-Pacific markets. Action in Washington would show crucial international trading partners that our support for free trade isn’t just hollow rhetoric. The National Association of Wheat Growers (NAWG) applauds the introduction of legislation that will create a national, science-based labeling standard for foods containing genetically modified organisms (GMOs) and urges Congress to quickly pass the bill. Sens. Ron Wyden, D-Ore., and Mike Crapo, R-Idaho, moved another step forward in providing a bipartisan wildfire funding solution that will ensure vital resources in the fight against catastrophic wildfires across the West. The senators attached a provision to the Senate budget that sets the stage for passing the Wildfire Disaster Funding Act, which Wyden and Crapo reintroduced on Jan. 22. The bill ends the cycle of underfunding fire suppression, which currently forces federal agencies to steal from fire prevention just to put out fires. Instead, Wyden and Crapo’s bill will end this so-called “fire borrowing” by funding the largest wildfires from a similar disaster account used to fund other natural disasters. The Interior Department and the Forest Service estimate these fires – about 1 percent – consume 30 percent of firefighting budgets.